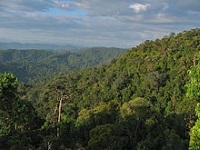 Spanning a vast area in Pahang State, Taman Negara National Park contains some of the world's oldest rainforest. Its richly diverse plant and wildlife have evolved over a staggering 130 million years, and its jungle trails lead past a small, seldom-seen population of the nomadic Orang Asli people. Their makeshift shelters appear in clearings, and several operators offer guided tours to their villages. Hiking the main path across the park takes about three days, and visitors can stay in wooden lodges between treks. Night-time jungle sounds are incredible, if a little unnerving for the uninitiated. Park visitors can also enjoy fishing, birdwatching, river-rafting and climbing the Peninsula's highest mountain, Gunung Tahan.